Designed for One Hand: The Perkins Unimanual Brailler works like other braille writers, except the keys for dots 1,2 and 3 will remain in a locked position until dots 4,5 and 6 are added or until the spacebar is depressed. Time Tested: Developed at Perkins in 1951, Perkins Braillers continue to be used worldwide. 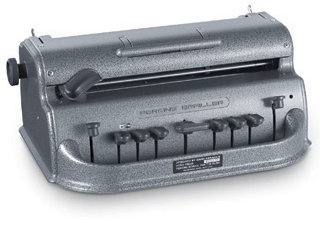 Durable and dependable, the Perkins Unimanual Brailler can emboss 25 lines with 42 cells on an 11” x 8 ½ “ sheet of paper. Can emboss 25 lines with 42 cells on 11” x 8 ½ “ sheet of paper. Extension keys for one-handed user can also be added to a Standard unit.